What we know as the potato is the edible tuber of a plant that is part of the nightshade family. There are thousands of different varieties that over the centuries have been brought to and cultivated all over the world, however even the wild ones can be traced genetically to a single origin – a region of the Andes that is part of both Peru and the very north of Bolivia. Potatoes are the world’s fourth largest crop after rice, wheat and maize. There are over 4,000 varieties of potato and they are categorized into main groups: russets, whites, yellows (Yukons) and purples. In Hawaii, Twin Bridge Farms is growing and harvesting the following varieties (depending on season): Norland and Chieftan (red skin),Yukon Gold, and a variety of Russet. Only the cooked tuber of this plant is edible as the leaves, flowers and fruit of the potato plant are highly toxic. Nutritionally, it is said that a human can live on diet of potatoes with only the addition of milk or butter (or any sources of vitamins A and D, the only two vitamins a potato lacks). Also, it contains minerals, fiber and of course carbohydrates. – Always wash your potatoes well before cooking. If you have a scrubber brush designated for veggies, get scrubbing. – Its a good idea to take a paring or any small fruit knife and carefully remove any “eyes” or bruises or cuts you see. The eyes are simply spots where the potato decided it might sprout a leaf, and sometimes the eyes can have a fibrous feel and bitter taste. Then peel or leave skin on if you want. – Potatoes can be cooked and enjoyed every which way: boiled, fried, steamed, baked, roasted, mashed. Select potatoes free of soft spots, blemishes and sprouting eyes. 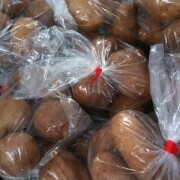 Store mature potatoes at room temperature in paper bag for up to two weeks in cool, dark, well-ventilated area. Avoide refrigerating mature potatoes as this affects conversation from starch to sugar and can cause an unpleasant sweetness when cooked. New potatoes can be refrigerated up to a week. If exposed to sun both mature and new potatoes will sprout – this makes them better in the garden instead of on the plate.